Where do you eat? Do you find yourself eating at your desk, taking bites in-between emails? Or how about finishing your fast food take-out in the car on your way home? Did you know that distracted, hasty eating can increase your chances of weight gain? Yup, it’s true. And research indicates that eating while driving or working at the computer may slow down digestion. If food is not digested well, you may be missing out on some of the nutritive value of the foods you are eating. So what’s the point? Take time to find a place to eat, without distractions and make it your eating place. Turn off the autopilot and focus on what you’re doing. Be aware of your environment and the food that’s on your plate. Take this time to be more conscious of your food choices and to really enjoy your food. And what are you eating anyway? Do you often restrict certain foods just to overindulge in them at another time? Have you ever thought about why you choose the foods you eat? There are so many “food rules” out there – “good” food, “bad” food. Labeling food this way leads to feelings of guilt. When you eat a “bad” food, you feel bad, you feel like you’ve done something wrong. Or maybe you just deprive yourself of the “bad” foods because they taste good and you shouldn’t enjoy your food. I don’t know know about you but I don’t want to feel guilty about the foods I eat nor do I want to avoid the foods I truly enjoy. Remember eating is a natural event and should be a healthy and enjoyable activity.Don’t make food the enemy. It’s not about one choice you make, it’s about the overall picture. One food, one time does not make you healthy or unhealthy. A person’s overall routine is what’s most important. A healthy lifestyle is based on an eating pattern to meet your individual needs and includes regular physical activity. 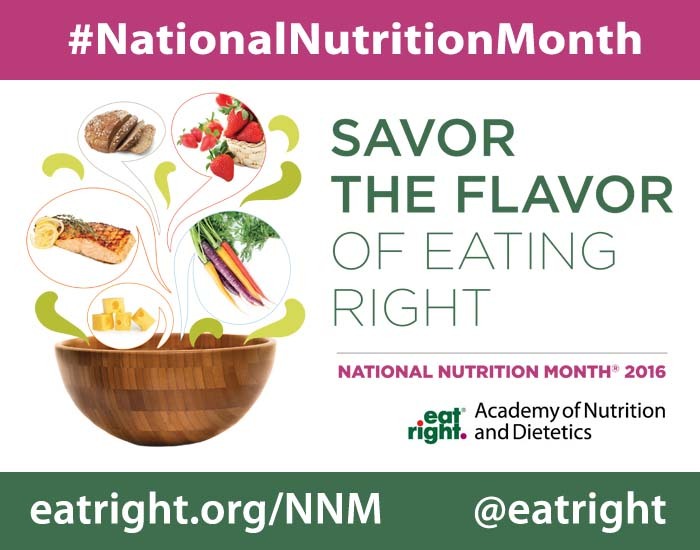 As National Nutrition Month wraps up, I hope you have enjoyed these tips! More importantly, I hope these tips have helped you focus on making informed food choices and developing sound eating habits. And hey, it’s Easter – take time to enjoy food traditions and social experiences. Take time to appreciate the flavor and pleasure of food. Practice mindful eating, learn to enjoy food in moderation. Most of all – give yourself permission to enjoy food.